is it possible to save the step-by-step execution route of the program? and so on, probably hundreds of calls... But according to the specific function, it might show "YES" and "NO". So, I want to save/remember the steps from the beginning to the "YES" window, and then compare it to the execution/steps, when it shows "NO". So, I could see on which handle (specific logic in function) the difference happens. You may want to use "Trace record" and "Run trace". 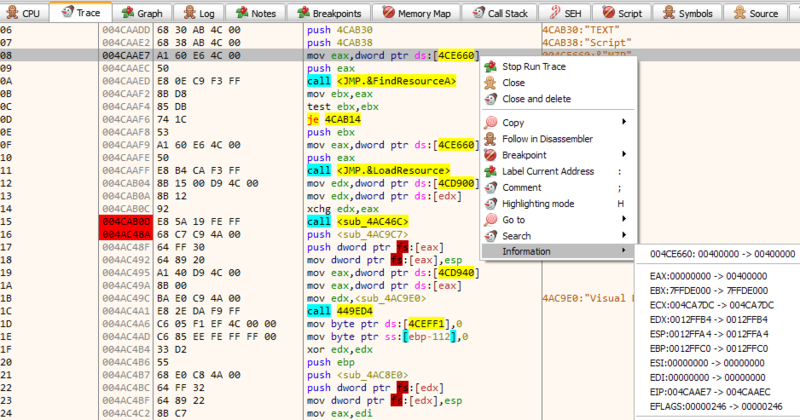 Using Trace record, the debugger records and highlights every instructions as you step through the code. You will easily know when the same instruction is executed twice by virtue of the highlighting. When "Run trace" is enabled with "Trace record", the debugger additionally saves the code execution path along with the state of the registers and associated memory at each step. Not the answer you're looking for? Browse other questions tagged debugging x64dbg or ask your own question.